CENTRAL BANK CHIEF Patrick Honohan doesn’t think Ireland is on the brink of another property bubble yet – but the “seeds of trouble” could be sown without its planned new mortgage rules. And the bank’s governor appears to have gone cold on the idea of relaxing its proposed lending laws – requiring home buyers to come up with a 20% minimum deposit – by letting borrowers to take out mortgage insurance instead. 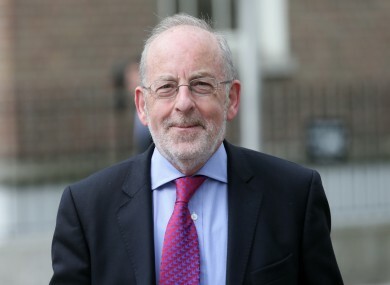 “What we’re concerned about is a systemic risk – a risk that property prices would, in the future, topple down again,” Honohan told an Oireachtas Finance Committee today. There’s a danger that if we mis-design this and lure in a whole business of mortgage insurance which was costly and not precisely targeted at the risks we’re talking about, it might not be the way to go. The Central Bank has flagged new lending rules from next year which would stop banks giving out loans worth more than 80% of a property’s value to the vast majority of its customers. Critics of the scheme have complained the plan would lock many first homebuyers out of the market if they didn’t have the backing of family money for a deposit. Those looking to buy in Dublin would be the worst affected with Central Statistics Office figures out today showing house prices had gone up nearly 25% over the last year in the capital. In a speech earlier this month, Honohan suggested it could be possible for borrowers to produce only a 10% deposit if another 10% was covered with mortgage insurance. But today he said giving borrowers access to easy money wasn’t the way to solve social problems like the gap between the rich and poor. About 2,800 mortgages issued last year would have been affected by the rules, Honohan added. “I would be very cautious about seeing credit and mortgage credit as a way of resolving inequality in society – the opposite is the fact,” he said. Honohan said the bank was trying to put in place a system to stop a second, credit-driven property bubble developing and another generation being saddled with too much debt. “Absent such a regime, sharp price rises in Dublin – and they jumped by 42 per cent in just 18 months – in a thin market, not yet eliciting a sufficient supply response, could sow the seeds of trouble for the future,” he said. Leaders from several of Ireland’s major banks have criticised the Central Bank’s proposed new lending rules, which also include a cap on how much people can borrow relative to their income. However Honohan said banks had clearly shown they were unable to regulate themselves and lend money sensibly. “I am not going to take seriously views of banks when they’re being told you can’t do this and that - if they say, ‘oh we don’t agree with that’,” he said. Email “The Central Bank's chief seems to have gone cold on relaxing its new mortgage rules”. Feedback on “The Central Bank's chief seems to have gone cold on relaxing its new mortgage rules”.